Churchgate Liaison Forum (CLF) was convened again on January 9th almost 2 years after its last meeting. Simons’ representatives gave an account of their current proposals. An apparently able and articulate architect gave a very clear account of what he thinks after 11 months of being involved with the project, with a clear explanation of the outline plans that he has drawn up. Simons development director had taken over from Charles Vyvyan, resurrected for this event and the previous front man, and clearly has extensive experience with retail developments. They were open in confessing that they should have involved the public earlier to inform them about the new plans. John Haykin, speaking for the market traders, gave a clear account of the impracticality of the Simons’ proposal for the market. 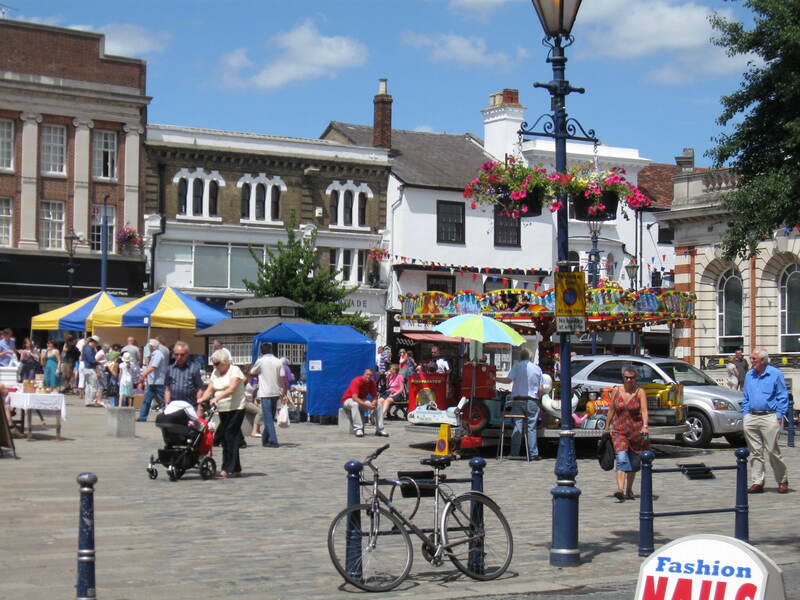 He noted that the space envisaged on St Marys Square was about the same as in Market Place – a location previously rejected as being too small. He contested the notion of dismountable stalls and noted that the plan to put stalls into the side of the anchor store building would be in units normally called “shops”, with all the extra costs that attracts. 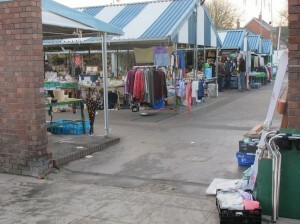 The parking for market traders had not been thought through. It seemed inadequate and would require stall holders to park at Woodside, at an unacceptable long distance from their stalls. Simons did not have any explanation as to why they had not consulted the market traders over the past year, but Charles Vyvyan did say that he had passed on the notes of comments made after their first scheme was consulted on. It was also made clear that many details of the exhibited plans would need more work if Simons were granted an extension of the contract and before they could prepare a planning application. The vast majority of the audience seemed opposed to any extension of the scheme. A few did speak in favour of it. One identified himself as Councillor Cowley’s husband (she is a member of the CLF panel). He thought that only those who opposed the scheme had turned up for the meeting. An alternative view is that 3 supporters out of the 80 or so present at the CLF might accurately reflect the level of support amongst the town’s residents. He did say what a majority would agree with, that the current state of the market and Churchgate was unacceptable. The differences come in saying that the Simons scheme was the only way forward. Have Simons got their M&S knickers in a twist? The retail patterns nationally have changed and there is no certainty that any anchor store can be attracted to the town – the essential component from Simons’ point of view for the scheme to be viable – and no certainty that they would be in business in 3 years time, which is about as soon as this scheme could be delivered. M&S were mentioned as one of the targets to take on the tenancy of the anchor store. The overnight news that they had a poor performance over Xmas was in the financial press, with the chief executive, Marc Bolland, being quoted as saying “we remain cautious about the outlook for the year ahead. Our plan is to transform Marks & Spencer from a traditional UK retailer to an international multi-channel retailer” (click here). So much for expecting them to invest in a traditional store in Hitchin! Amongst many comments made the financial, social and historical aspects were emphasised. It has become known that Simons would like to have the availablility of up to £2.1M to ensure that they can meet the likely costs to attract a large retailer to the central and all important anchor store. They suggested that a much smaller sum might only be needed. It was asked whether this would be as a grant or a loan. The reaction from Simons and NHDC officers indicated that they had not worked out that detail! It was mentioned that the current owner of Churchgate pays 40% of rents to the Council. This follows a financial deal done when it was built 50 years ago. Any new development built by Simons would only pay 10% to the Council. NHDC has defended this in the past by saying that because there would be a larger development the total they received would be the same. This has seemed a bad deal – NHDC gives away 7 acres of prime town centre land and gets no more money. However that was calculated on the scheme presented 2 years ago. The current scheme has fewer shops and the anchor store would not pay rent for 8 years. So presumably the Council would get less out of the new scheme over 7+ acres than it does out of the run down Churchgate arcade now! If the Churchgate rent deal with the current leaseholder, Hammersmatch, was changed now then they would have more to refurbish and develop that area. If the market had a longer lease and some security they could apply for more grants and could invest more to make that area so much better. 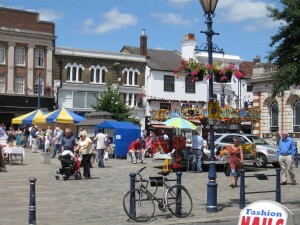 Many comments were made about the social experience of being in the town – not just a shopping centre, but a meeting and talking centre. It was suggested that the new proposals did not seem likely to enhance that. That while the pictures in the exhibition gave a rosy glow, the street scene would actually be bleak and likely to mimic the unfortunate shopping arcades which have no soul and no conversation. Another aspect of the social life was voiced, of the breakdown of trust between local people and Simons, and maybe the Council. We expect changes to be discussed and opinions respected. 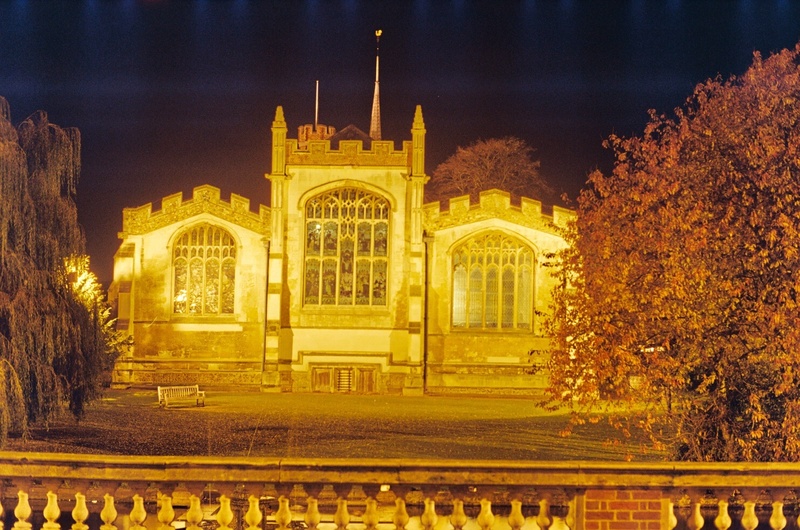 The lack of conversation about the present scheme, the failure to talk to the market traders, and the failure to remember what Hitchin people said when the Churchgate Development Brief was drawn up, all expose that lack of social sensitivity and a failed relationship. The importance of the church, the Biggin and the almshouses were all mentioned as important to respect and enhance, not overshadow and hide. It was also emphasised that the town has grown in a haphazard and charming way, over centuries. That peculiar historical charm is not easily reproduced, and can be easily destroyed with a large development. Another historical aspect, not mentioned directly, but emerging from the discussion, was the useful aspect of a market as a buffer zone. We do not know how the retail sector will develop, how many shops we will want and will be viable in 10 years time. The market, a slightly untidy part of that scene, will grow and shrink as the retail sector does. However if it shrinks we are left with a free space, not an empty shop. Maybe that is partly why it has remained as part of the street and retail scene in Hitchin for a thousand years or so.